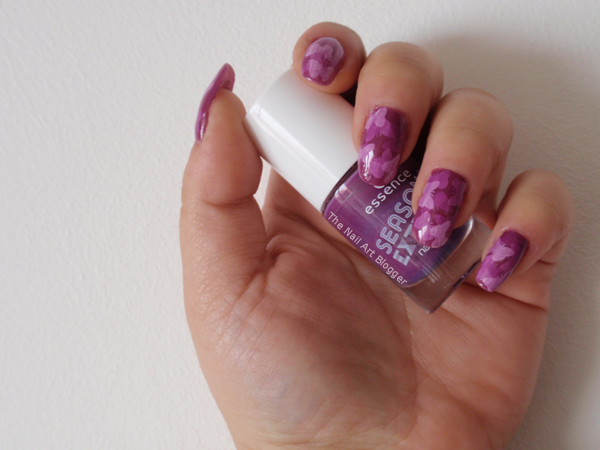 Ever heard of the jelly sandwich nail art? Well, it's when you use layers of jelly nail polish and stamp in-between layers. Since I don't own any jelly nail polishes, I decided to use one that is sheer even after three layers. 01 Little Miss Bright from the Season of Extremes limited edition by Essence has a lovely purple shade, but unfortunately I can only get it to become opaque with 4 layers, which for me is a bit too much. So I decided to use it in a sandwich technique and see what comes out of it. 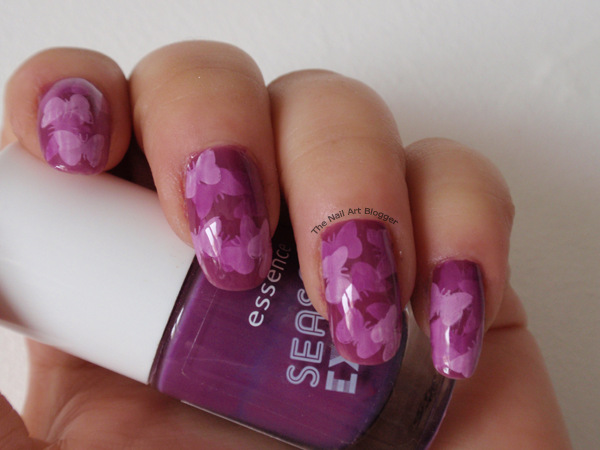 So I used that as the base (jelly) color, and a white stamping polish from Essence. After a layer of base coat, I applied a layer of Little Miss Bright, waited for it to dry, and then stamped a butterfly from the stamping plate of the Loveletters limited edition from Essence. Waited for that to dry and then applied another layer of Little Miss Bright, waited to dry, stamped over it and placed the butterflies in other spots on the nail this time. And I repeated that one more time, finishing off with a final layer of Little Miss Bright, and once it was completely dry I added a layer of top coat. I really liked the end result, even though the polish looks a bit streaky on the lighter areas. I think I should invest in a couple of real jelly polishes and try this method again, just to see how the result would be. So what do you think? 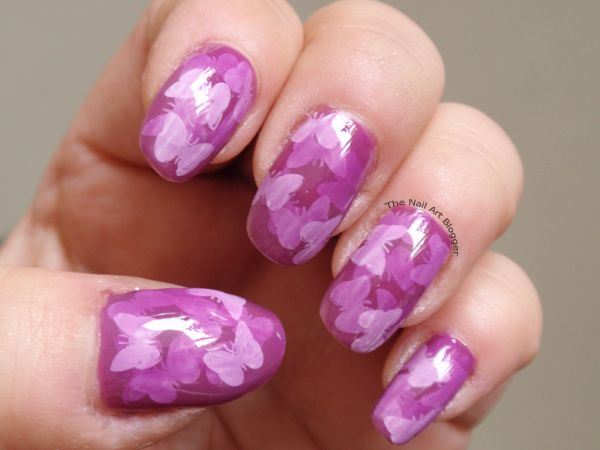 Would you have butterflies on your nails for Valentine's? Or do you prefer the more traditional approach to it? This is lovely. I really like the jelly sandwich looks. I nominated you for the Blog Your Heart Out Award. 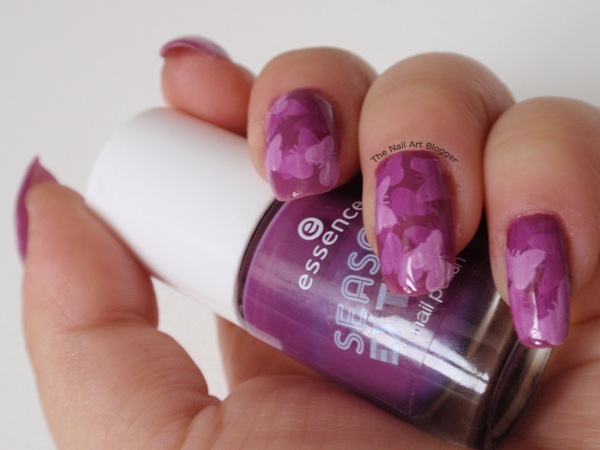 You can check it out here http://nailsndetails.blogspot.com/2015/02/blog-your-heart-out-award.html.